Home > New England Glass Co.
LCK743. Joseph Locke of New England Glass Company created this ware called “Locke Art”. It involved a combination of needlepoint and etching to create this intricate decoration. 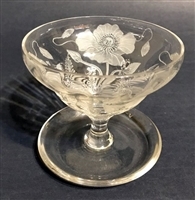 This design is of poppies, blossoms and leaves on a clear crystal glass. 3 5/8” diameter, by 3 1/8” tall. Signed with inscribed "Locke Art"
AMB838. 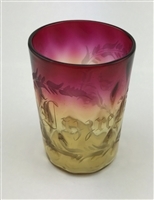 Three Diamond-quilted Amberina tumblers from the 1880’s having the finest possible coloring. Each of them has a ground and polished pontil and are being sold as a set. 4” tall. $175 for the set of 3. AMB848. 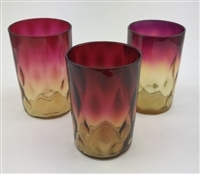 Set of three amberina tumblers in the swirl pattern. All have polished pontils. 3 ¾” tall. Excellent condition. NEG765. Under patents received by Joseph Locke, in 1885, the New England Glass Company produced this ware called Pomona. There were two types of Pomona produced - First and second Grind. This is the first grind which required more time and expense to create, and consequently led to the production of second grind. This is a nice example of a first grind lemonade with the cornflower decoration. It is in excellent condition with nice staining and would be a welcomed addition to any collection. 5 3/4" tall. AMB839. Amberina from the 1880’s is hard to find, but to find cut or engraved amberina is even rarer. 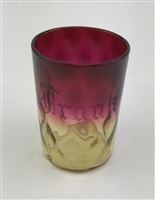 This is an amberina tumbler with the finest coloring and is engraved “Frank”. AMB841. Amberina diamond-quilted Nappy with beautiful coloring and an applied amber reeded handle. Polished Pontil. 5” diameter, 6” overall. New England Peach Blow Spooner in matte finish with ruffled top in pink rose coloring shading to white. 4 ½" tall. AMB845. 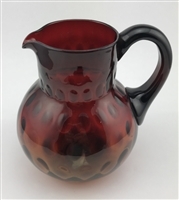 Amberina bulbous inverted thumbprint bulbous pitcher with an applied amberina handle. The coloring on this pitcher is very dark and has a ground pontil. Excellent condition. 6 ½” tall. From the 1880’s. New England Peach Blow sugar and creamer with slight vertical ribbing and applied white loop handle. These pieces were made by Mt. Washington using the New England formula and made for Libbey to be sold at the World's Fair of 1893. They are both 2 ½" tall.